1 Mix all ingredients—except for the Steak Seasoning—together in a bowl. Place the steaks in a gallon-sized Ziplock bag (no more than 2 steaks per bag) and pour enough marinade into the bag to cover the steaks halfway when they are lying flat. Squeeze all excess air out of the bag and seal. Allow the steaks to marinate in the refrigerator, lying flat, for no longer than 2 hours. Remove steaks from marinade 30 minutes before grilling. 2 Sprinkle the ribeyes with the Steak Seasoning. 3 Prepare grill and cook steaks over direct high heat, cooking until desired doneness is reached 10-12 minutes for medium rare. Turn the steaks once during cooking. 6 Combine all ingredients and mix well. Store in an airtight container. 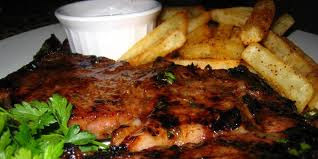 Enjoy the marinated rib eye steak !